Orange entered the Swiss mobile market in 1999. Today, with over 900 employees and 1.68 million customers, Orange Switzerland leads the mobile domestic internet market. As Orange Switzerland’s digital marketing evolved and incorporated new vendors, managing tags became increasingly time consuming and complex. Three technical teams were managing tags manually across Orange’s web properties (e-shop, retention site and Orange portal), causing considerable strain on valuable development resources. 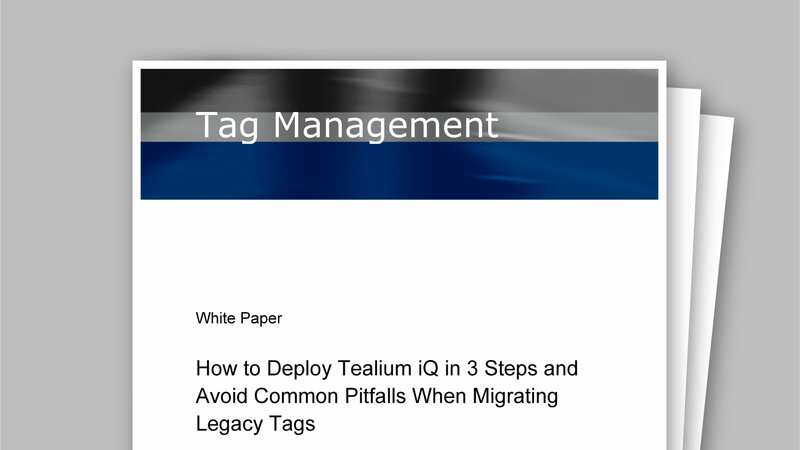 Reduced reliance on IT: Tealium iQ’s ease‑of-use has made managing existing tags simple and efficient. For instance, after the launch of the iPhone 5, one tag began to cause load issues on the order confirmation page. The marketing department was able to investigate and fix the problem, minimizing the loss of conversions during an important and profitable launch period. Flexibility: With over 30 tags successfully implemented and managed over multiple sites, Orange Switzerland has the flexibility to increase the sophistication of its digital marketing activities. The company has since effectively implemented Google AdWords and SiteCatalyst on all mobile applications, as well as re-tag its newly designed e-shop. World-class support: The Tealium technical support team ensured Orange Switzerland fully optimized Tealium iQ. After implementation, Orange Switzerland was able to swiftly and effectively deploy tags from multiple vendors, including DoubleClick, Webtrends, Appnexus, Zanox and Optimost, across its web properties. Tealium iQ has successfully streamlined Orange Switzerland’s tag management process, eliminating the complexity of implementing tags manually, significantly reducing reliance on the company’s three technical departments, and increasing digital marketing agility. Orange Switzerland’s comprehensive use of Tealium iQ has provided the digital marketing team with new-found agility which was previously lacking. The marketing team found they no longer needed to rely so heavily on their IT team. In fact, this reliance was reduced by 75%. Without Tealium iQ, the process of deploying tags could take several weeks. Now, the marketing team is able to implement new tags, or isolate faulty tags, in a matter of hours. The comprehensive management of digital marketing campaigns across multiple sites became far easier for the marketing team as internal processes became more streamlined, and they were able to retain greater control.